Remember eating spaghettios as a kid? I do! I have to say I don’t love them now as an adult, but I do love my “Cheesy Grown Up SpaghettiOs I’ve made for you today. 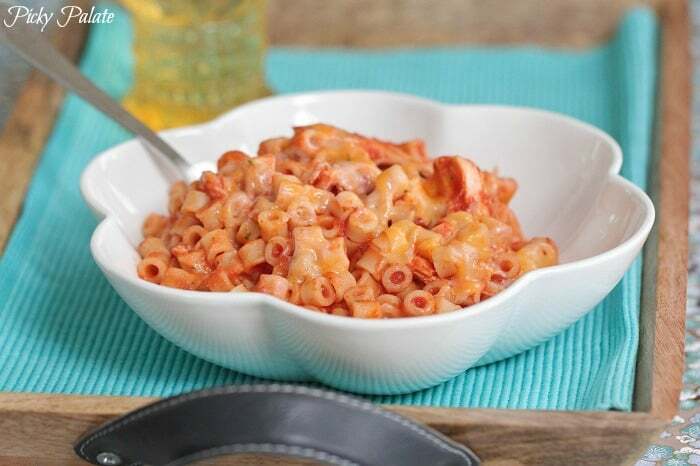 Growing up, I remember and my dad making a bowl of pasta, then adding butter and tomato sauce (with lots of black pepper) for lunch on a number of occasions. It is the simplest of ingredients and for some reason is so good! I re-created that lunch I remember him making so many times as a kid with a few little additions of my own. The family will go nuts over this recipe. My kids even polished off all of the leftovers throughout the week. Here’s your simple ingredient list. 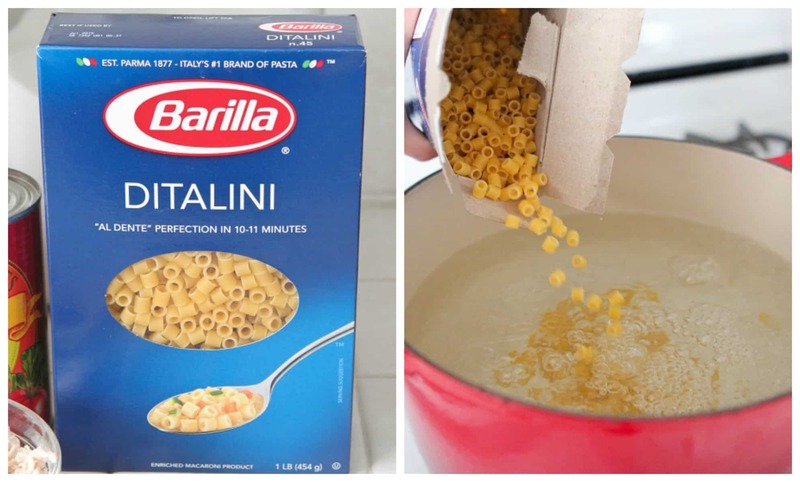 I used Ditalini shaped pasta, it looks similar to the traditional spaghettio shape. Time to cook the pasta! 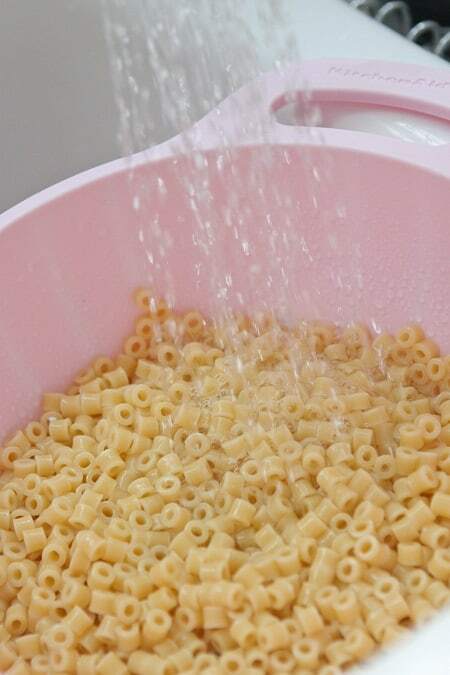 Once your pasta is cooked, make sure to rinse it under cold water. Keeps it nice and al dente. Here’s the magical sauce inspired by my dad. 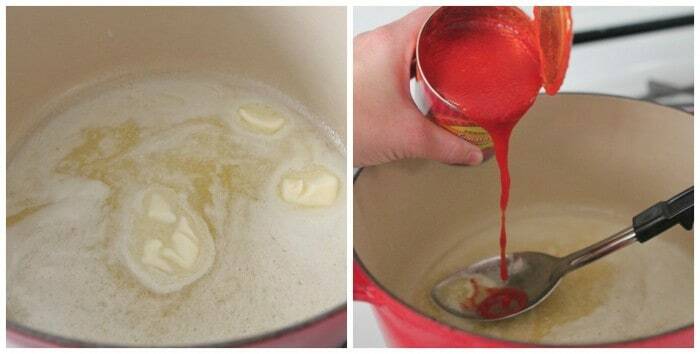 Melt a stick of butter than add your tomato sauce. Can you handle the difficulty? Add your cooked pasta back to the sauce. Give a little stir and add some cooked shredded chicken. 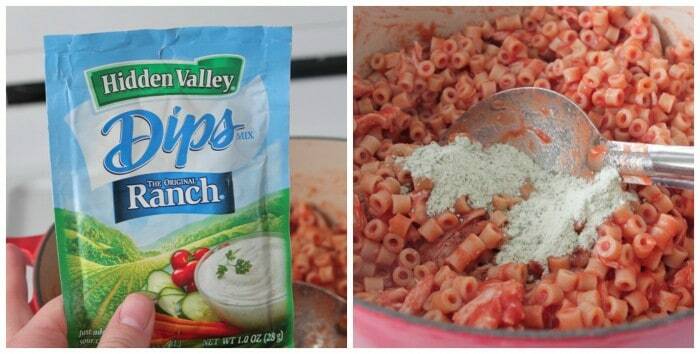 Add a tablespoon of Ranch mix. 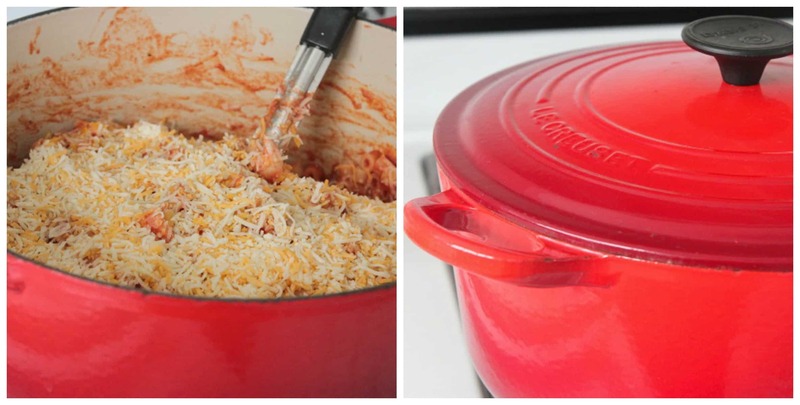 Top with some lovely shredded cheese then close with a lid to melt. Yes! Cheesy and perfect. Now it’s time to eat. Enjoy! ….I even added a few shakes of hot sauce to mine. Give that a try too. Cook pasta according to package directions then drain under cold water to stop cooking. Melt butter into a large dutch oven or pot over medium heat. Add tomato sauce, stirring to combine. 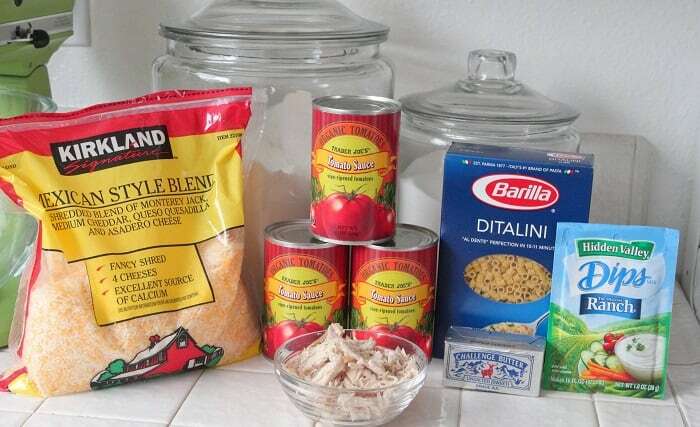 Add your cooked pasta to the sauce along with the shredded chicken, Ranch seasoning and black pepper. Stir to combine, reduce heat to medium low.. Top with shredded cheese and close lid to melt cheese for 3-5 minutes. Once cheese is melted, serve. 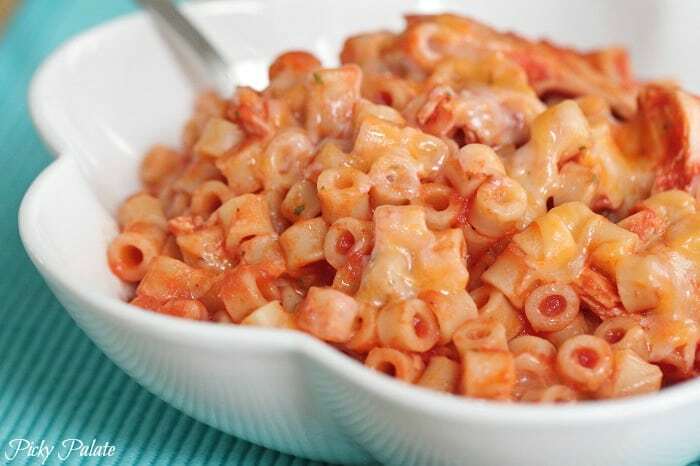 I did the same kind of easy to do and “kids-esay-eating” recipe yesterday with “coquillettes” pastas, tomatos, minced meet, origan and worcestershire sauce. Can’t wait till diner to enjoy leftovers ! Oh yum! This looks so good! And easy! I have never had spaghetti-os! But I will be trying this out for dinner (and next day lunch!!!) soon! Okay, I have to admit that spaghetti-o’s were a guilty pleasure in my teens. I can’t touch the stuff now, but this homemade version looks like a great alternative! YUM, YUM, YUM! I love this grown up version!! 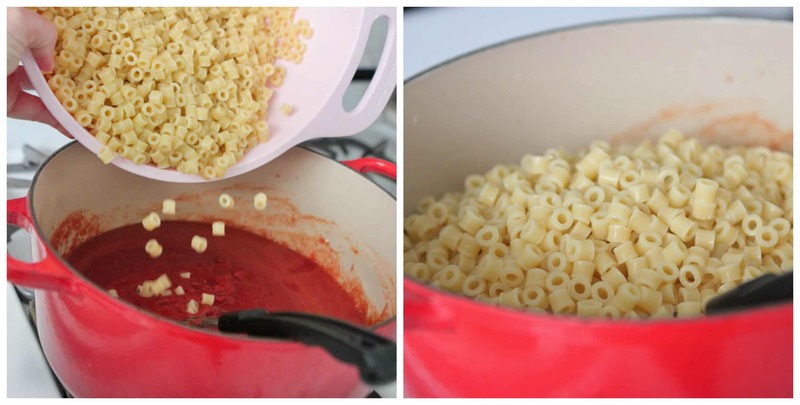 OMG — I still love Spaghetti O’s (embarrassing) and I cannot WAIT to try these!!! Now that is a tasty sounding pasta! But Mr Kevin it is missing Bacon…. My family are already nuts but could be nuttier 🙂 I have good spaghettio memories too!! Looks wonderful. I always cringe when I serve my kids the ones out of the can. I can’t wait to try this. Is there anything I can replace the ranch dip with as we dont have that here? I just used herbs like basil,oregana, garlic and a little chopped onion instead. Hi Nancy, yes a mix of those herbs would work just fine 🙂 Hope you enjoy! My kids saw the picture and were sold. They can’t wait to try these. 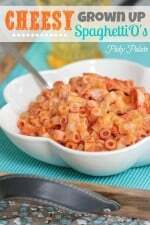 I am NOT a spaghetti o’s fan, but I will be making them these to try! Great recipe, thank you! I’ve never been a big fan of spaghetti-os, but I know I’d love this!! My coworkers and I were literally just talking about the kid foods we still crave yesterday and the consensus was Spaghetti O’s were the stuff childhood was made of! I’m so trying this new “adult” version. STAT! This will be going on my menu for next week. Thanks!! oh wow. this looks like a meal my kids would flip for! 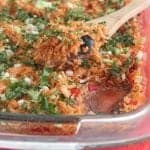 Love this recipe, but will leave out the ranch dressing as it contains MSG. I was obsessed with spaghettios growing up – I was so excited to see this recipe today! Mmm, that looks really yummy! The little kid in me is kinddaaaa freaking out right now. This looks SO mouthwatering! 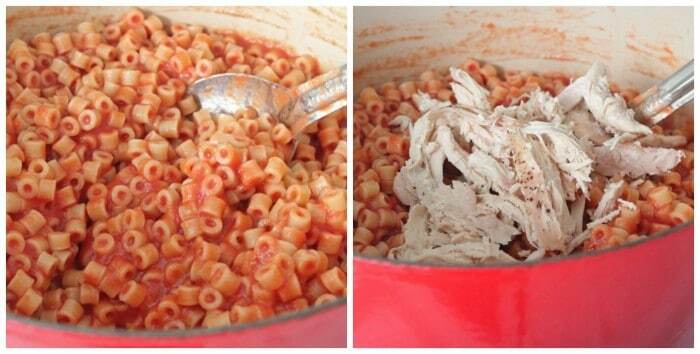 my hubby still eats spaghettio’s from the can…it kills me. so this will be fun to try a homemade version for him. This looks so simple yet so perfect and comforting! Much to my Mom’s dismay, I am 45 years old and can still eat Spaghettios – and do a couple times a year just for old times sake – served with toasted Butternut white bread with butter on the side. I too made a grown up version of spaghettios and meatballs – let me know what you think! I think this is what we need for dinner, comforting and simple. Thanks Jenny! Oh my goodness! Looks SO good!! I’m about to head down to my parents’ house where they’re observing Passover. I better get my pasta fix in before that happens… and this might just do the trick. 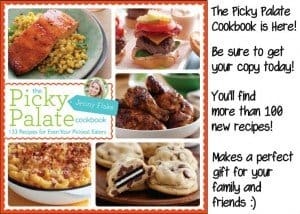 hey jenny, i saw this recipe yesterday and thought it looked intriguing so i made it. holy cow, it was delish! i sent a bowl up for my sister to taste and she ate the whole thing (after supper). 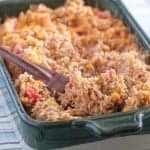 don’t hesitate this is a great recipe that looks like it would be nothing. even the kids like it. good job! Thank you for sharing! This recipe saved the day yesterday. My husband randomly wanted spaghettiios and I wanted chicken. Perfect! 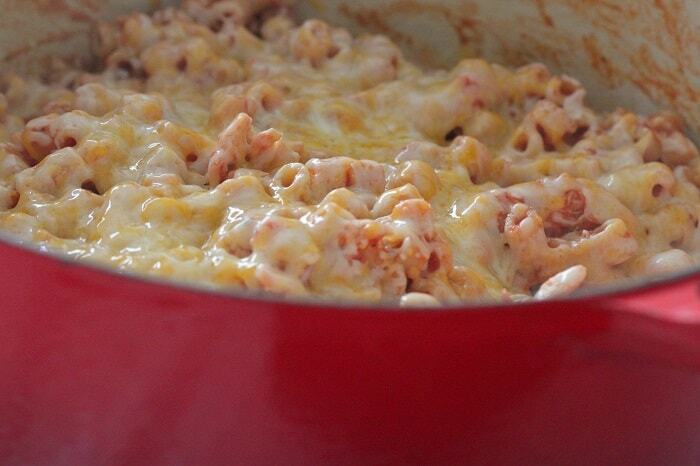 Making this tonight with cheese filled breadsticks! Yum, Making this for dinner tonight. I will use my own homade ranch mix though! Also what do you serve this with? Salad and bread? Made this for the first time tonight. Just finished a bowl……divine! Thanks for sharing this recipe! We made the pasta with butter and tomato soup and of course lots of black pepper! 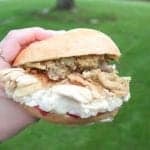 This was a quick and cheap way to make lunch for us without the preservatives! 🙂 Thanks for your website! Oh this is a must make. Looks delish! Thank you.